As Illinois celebrates is bicentennial year, Gov. Bruce Rauner urged lawmakers to set aside partisanship and use state’s historical successes as a guide to its potential for the future. Democrats, and even some of his fellow Republicans – including primary challenger Rep. Jeanne Ives – immediately cast doubts on the sincerity of that message. Senate President John Cullerton says Rauner is incapable of making a deal, and hasn’t tried, noting that Rauner and the four legislative leaders haven’t collectively met in more than a year. “Three years of political attacks, and then he suggest that maybe we should start working together. I hope that he was being sincere but you have to really question that,” Cullerton said. 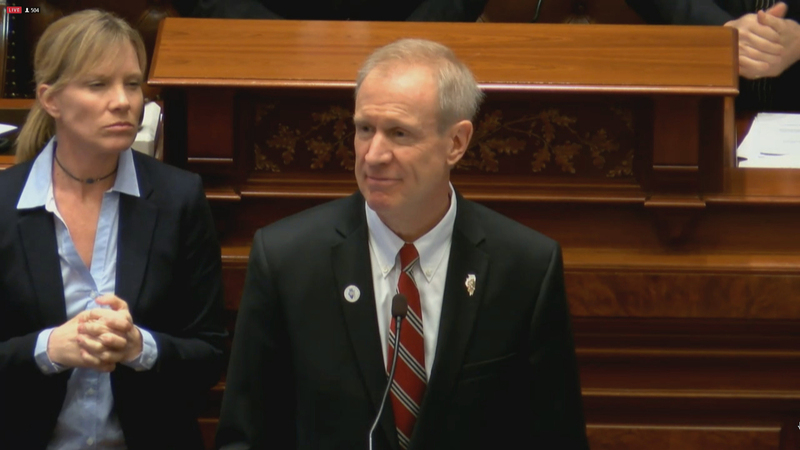 Video: Watch the State of the State speech (Rauner enters around the 25-minute mark). You can also read his prepared remarks here. The annual address comes at a critical time for Rauner, who has been marked as the nation’s most vulnerable governor by RollCall and the Cook Political Report. Much of the agenda Rauner wants legislators to support is what it has been: less red-tape. Term limits. Lightening the state’s $100 billion-plus pension debt. Property tax relief. Not mentioned during the address were Rauner’s plans for restructuring the state workforce, should the U.S. Supreme Court limit union organizing in a pair of upcoming decisions. An executive order creating the position of a “chief compliance officer” who will have to take up allegations of sexual harassment or other types of misconduct within 10 days’ time. Rauner has sole jurisdiction over the executive branch; he called on the legislature to pass a similar measure. The move was a nod to a capital culture of rampant sexual harassment; many legislators and lobbyists wore all black Wednesday, in recognition of the “me too” and “time’s up” hashtag movements. Rauner also called for a law to ban lawmakers from acting as property tax attorneys. Though he didn’t name House Speaker Michael Madigan during the speech, Rauner has previously called Madigan a “crook” for making money off a “corrupt” property tax appeals system. Madigan issued a statement saying that Rauner yet again chose to “blame others” instead of being a leader and said “if the governor were as serious about addressing property taxes as he is about scoring cheap political points,” families would have relief. Overall, the response to the speech was muted, and tepid; the most striking moment coming when the governor promised to introduce a “balanced” budget during his next major address before the joint chambers of the General Assembly, on Valentine’s Day. Some Republicans clapped in earnest, but Democrats also erupted, spontaneously, as if to say “finally” and to express their doubt. The governor went off script and retorted: Maybe this time you’ll pass my budget instead of ignoring it. Rauner’s primary challenger, Ives, says she has enthusiastically cheered Rauner on during his previous speeches, but couldn’t this time. Democrats running to replace Rauner were likewise enthusiastic, and universally called his plans thin. A new poll by We Ask America has J.B. Pritkzer in the lead, but shows Sen. Daniel Biss, D-Evanston, ahead of him in the suburbs and edging Pritzker in Cook and the collar counties; Chris Kennedy is now in third place overall: results that, overall, show the contest is still anyone’s to take. Jan. 31: State legislators override Gov. Bruce Rauner’s amendatory veto of a trailer bill to the state’s new evidence-based funding formula. But school districts awaiting new state equity funding will still have to wait to get those dollars, according to one bill sponsor. Jan. 30: Even as Gov. Bruce Rauner is expected to call for bipartisanship Wednesday, a source with knowledge of the speech says he will call for legislation that takes direct aim at House Speaker Michael Madigan. Jan. 29: The Republican candidates for governor squared off Monday for the first, and potentially only, time.